Hi, everyone! Looking for a neat way to add a personalized touch to this year’s Christmas gifts? Here’s an idea for you: make them interactive with shaker tags to put on your packages! 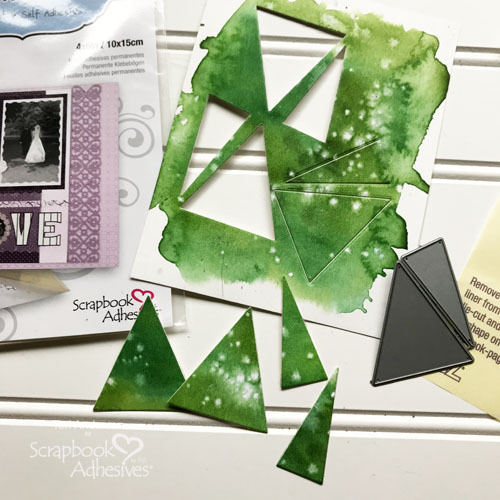 It’s a snap with Scrapbook Adhesives by 3L® products. 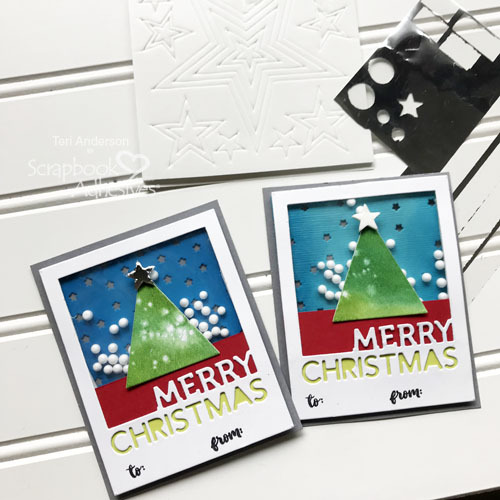 Start by die-cutting a couple trees from cardstock or patterned paper. If you want to kick things up a notch, apply watercolors to watercolor paper and use that to make your trees. 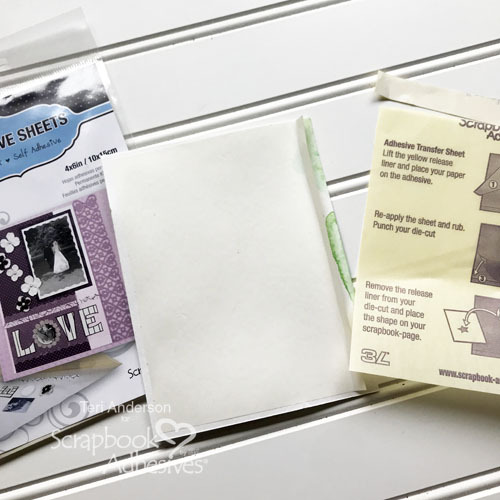 Before you die-cut the trees from your paper panel, be sure to apply one of the Adhesive Sheets 4×6 inch panels to the backside of your panel. This will result in the trees having adhesive on them so you’ll be able to assemble your tags quickly. 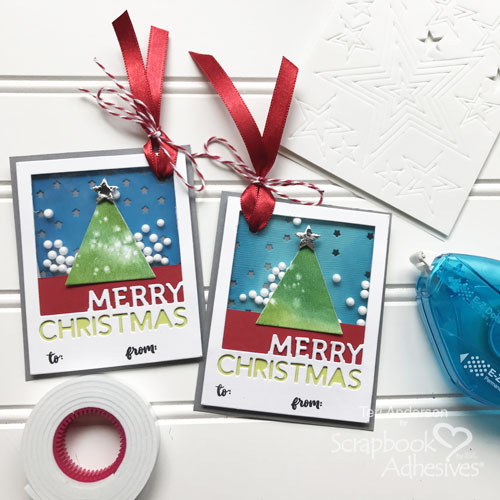 Cut a Merry Christmas frame from white cardstock for each tag you want to make, plus strips of green and red cardstock. Stamp the words “to” and “from” onto the frames. 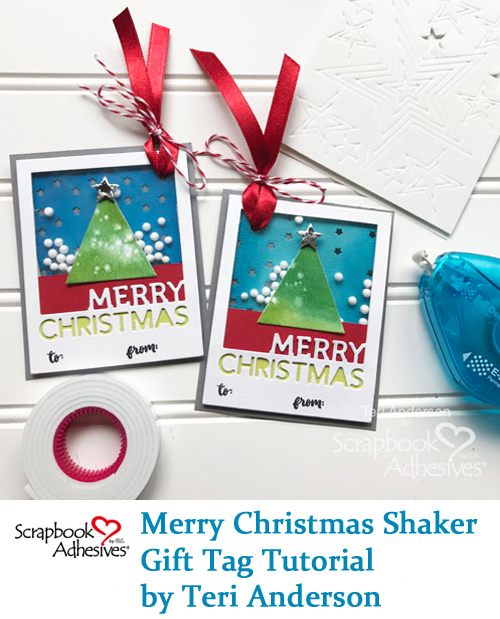 Flip the frames over and adhere the green and red cardstock strips so they appear behind the “Merry Christmas” sentiment. You’ll also want to cover the openings of the frames with transparencies. 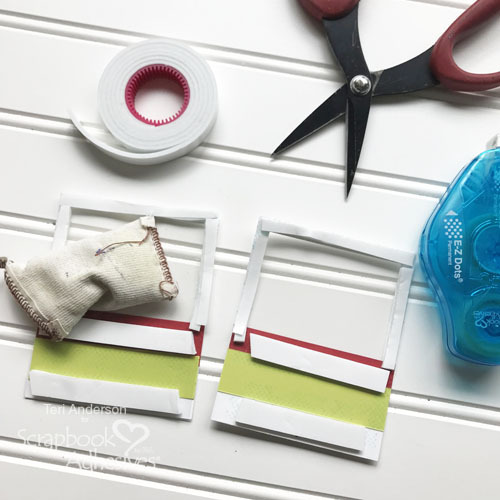 Cover the back of your frames with strips of Crafty Foam Tape White. Now the tape will be too big for some spots on the frames so you’ll need to cut in half with your scissors. Don’t worry if your cuts are not perfectly even. No one is going to see this when your shaker tags are complete. Drop some small foam balls or sequins on the windows. 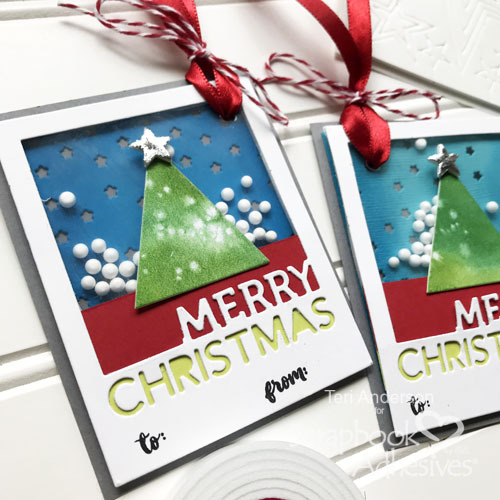 Remove the tape’s backing paper and adhere a starry die-cut background to them. (Don’t have a starry background to die-cut out of card? Use a starry patterned paper instead). 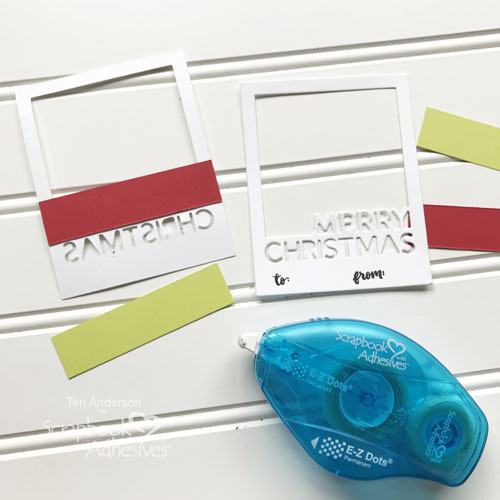 You’ll also want to cut mats, slightly larger than the Merry Christmas frame, to serve as the base of your tags. Once you have the mats, adhere them to your frames! Add your trees to the front of your tags. Top your trees with a 3D Foam Stars. Apply either glitter or foil to the stars. 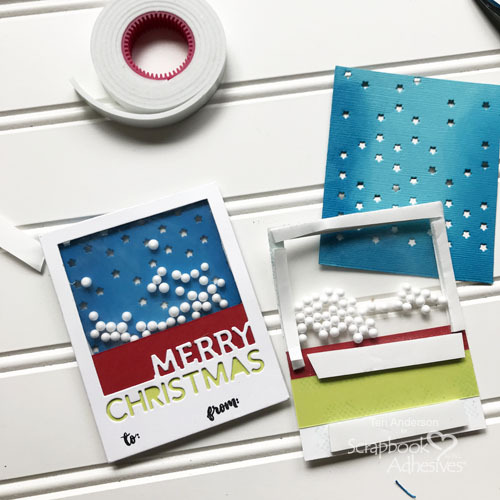 Complete your tags by poking a hole in the corner of each one and bringing some ribbon through the holes. Kick things up a notch by tying some red and white baker’s twine around the ribbon. I hope you enjoyed today’s tutorial. Be sure to check out our blog for even more great ideas! This entry was posted in 3D Foam Shapes, Adhesive Sheets, Adhesives, Beginner, Crafts & Tutorials, Crafty Foam Tape, E-Z Runner® Dispensers, Gifts, Permanent Adhesive, Seasonal Craft Ideas, Skill Level, Tutorial, Wear your Adhesive on the Outside, Winter and tagged 3D Foam Holiday Embellishment Kit with Foil, 3D Foam Stars, Adhesive Sheets 4x6", Bakers Twine, Crafty Foam Tape White, E-Z Dots Permanent, Kuretake Gansai Tambi Watercolors, Ribbon, Simon Says Stamp, Sunny Studio Stamps, Teri Anderson, Watercolors. Bookmark the permalink. ← Free! All Occasion E-Book Download! One Response to "Merry Christmas Shaker Gift Tags"